Support WGGS with Amazon Smile! – Working Group on Girls of Schenectady, Inc.
Support WGGS with Amazon Smile! UPDATE: we now have a customized link: follow it to start supporting WGGS when you shop! Did you know that you can raise money for WGGS just by shopping online? 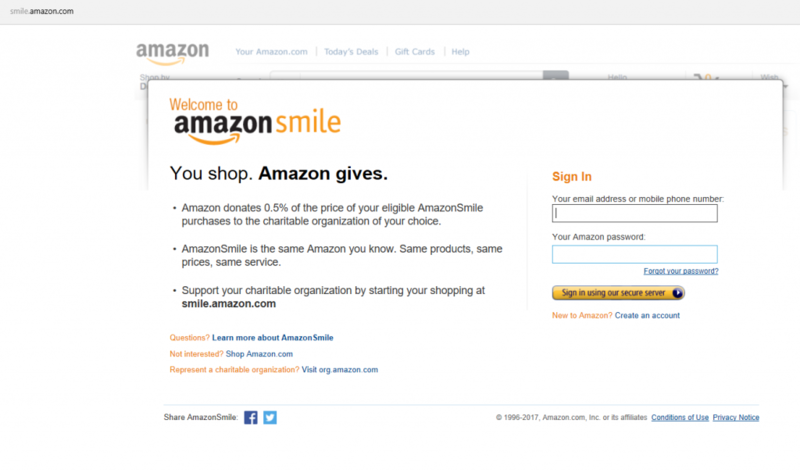 It’s easy to Join AmazonSmile! Just go to smile.amazon.com, then choose Working Group on Girls of Schenectady, Inc. as your designated charity. Without any additional cost to you, Amazon will donate 0.5% of many of your purchases to WGGS! This works even for Prime members. If you’d like more information about the AmazonSmile program, click here. For a more detailed explanation of how to get yourself signed up, read on. If you already shop with Amazon, just sign in as usual. If you are new to Amazon, click the blue “Create an account” link that you see just below the yellow button. You’ll need to fill in your name, email address, and a password. 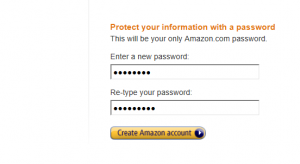 After filling these in, you’ll click the yellow “Create Amazon account” button, and you’re done. Once you’ve signed into Amazon Smile, your computer will “remember” you next time. After you’ve signed into Amazon Smile, you’ll be prompted to select an organization. 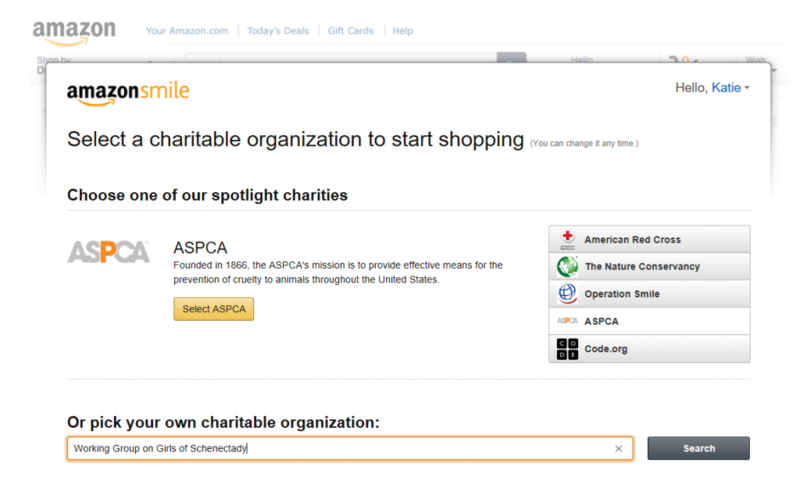 Amazon will have some suggested charities, but you can also choose to your own charitable organization. Choose us, please! Go to the space under “Or pick your own charitable organization:” and type in “Working Group on Girls of Schenectady,” then click the “Search” button. AmazonSmile will identify us (hooray! ), and you can click the yellow “Select” button to choose WGGS. But going to AmazonSmile.com will likely mean a new habit for you. You might want to put a sticky note reminder next to your computer or update your browsers book marks so that you remember to shop from the AmazonSmile page. Go ahead and treat yourself to something! You can click on this “Supporting: Working Group on Girls of Schenectady” link to see how much money you’ve earned or to update your preferences. Thanks so much for taking the time to support Schenectady girls!